So far it’s been a little eventful: A trip to Long Island, the tot’s first vacation away from mommy and daddy (it was a loooooong week without her! ), swim lessons, preschool preparations, still trying to sell a house and keeping it tidy, catching up on the cleaning, baking, trying out new stuff…It’s never-ending!! I’ve started this “diet” plan last month, and after I got back from NY it fell through, but I needed to do it anyway. Salads everyday for lunch. Every. Day. No snacking in between; just water. If I had carbs in the morning, that was it for the day. Then it was protein for dinner along with some fruit. Did it work? Yep! I lost a few pounds in the process! The hard part was cutting out the sugary stuff some, and let me tell ya, it was HARD!! It’s true what the experts say, that a sugar addiction is the same as having a drug addiction…yikes!!! So, um…with me getting closer and closer to 4-0 it did dawn on me that maybe I do need to cut back on the sweets a bit and that I can’t eat like I did when I was 25, but I refuse to give up my love for baking!! I’m willing to share the goodies to friends and coworkers so there’s less of it for me. The big challenge will occur starting in September when I try again with my holiday baking and resisting from eating all the goodies. Now that I will not have any unexpected phone calls or unfortunate family events happening (pray that I don’t again!! ), I’ll be able to get my mixer going in high gear! But anyway, back to eating healthy…. I started going to this really neat salad/sandwich place in town because I had coupons, and one of the coupons was for a free sandwich. 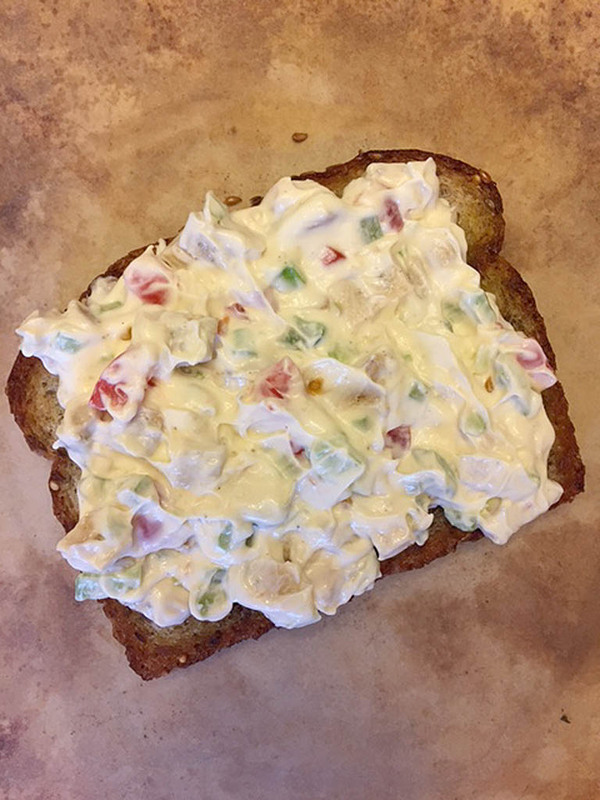 I went for the chicken salad sandwich and it was good, except it wasn’t very big. I paid nothing for it, but it didn’t look like a $9 sandwich to me! Just my opinion, but again, great sandwich, but on the small, expensive side. No, I didn’t call the restaurant to complain; I’m not that type of a person. 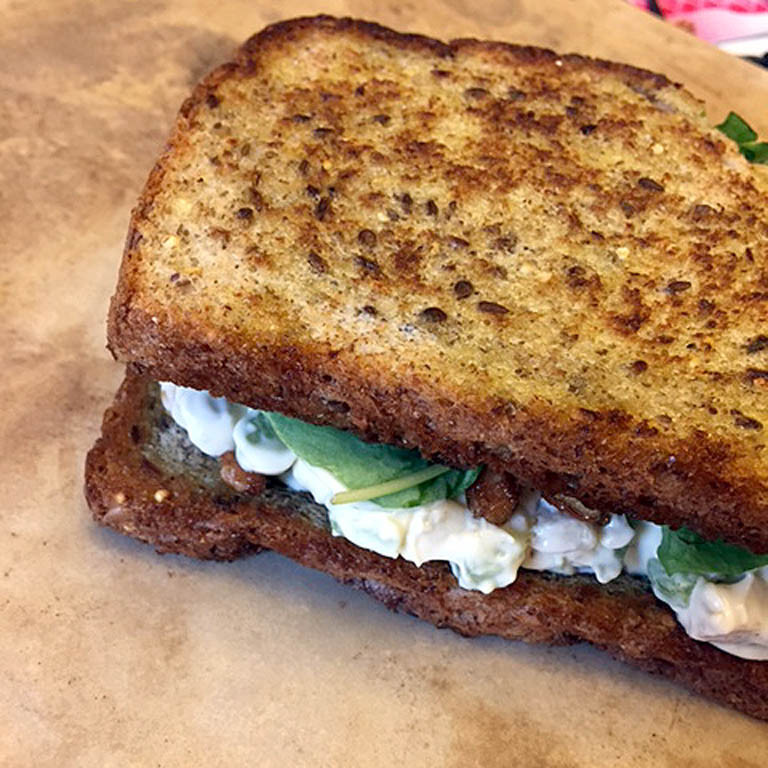 It even had candied pecans in it, which I normally wouldn’t go for, but it gave the sandwich a nice, sweetness to it. And the bread was like a rye bread, which is the type of bread my parents craved, especially when it came to reubens. Yum yum!!! So while eating it I decided to create a copycat version of it with a little bit more stuffing. It has some steps to it, but it makes it worthwhile! First off, the bread. The local grocery store offers lots and lots of awesome breads. I went for a flax and fiber bread, because it looked pretty with all the little seeds in it and I need fiber in my life. But you be the judge and decide what kind of bread you’d prefer for your sandwich. You can either toast your bread in the skillet with a little bit of margarine for an added crunch or leave it as is. Next is the stuffing: I used thin slices of cooked boneless/skinless chicken breast, lightly drizzled some olive oil, sprinkled on some garlic and herb rub, and cooked them in my grill pan. Once finished, I chopped them up in small chunks. While cooking the meat, I chopped up some grape tomatoes and celery. Once the chicken was chopped, I put the ingredients in a bowl mixed with mayo. I kinda overdid on the mayo, but I wasn’t complaining; I like mayo! And if you end up not using all the chicken, throw it in a salad! Finally, assembly time! Top it off with spring mix lettuce and candied pecans (directions below). 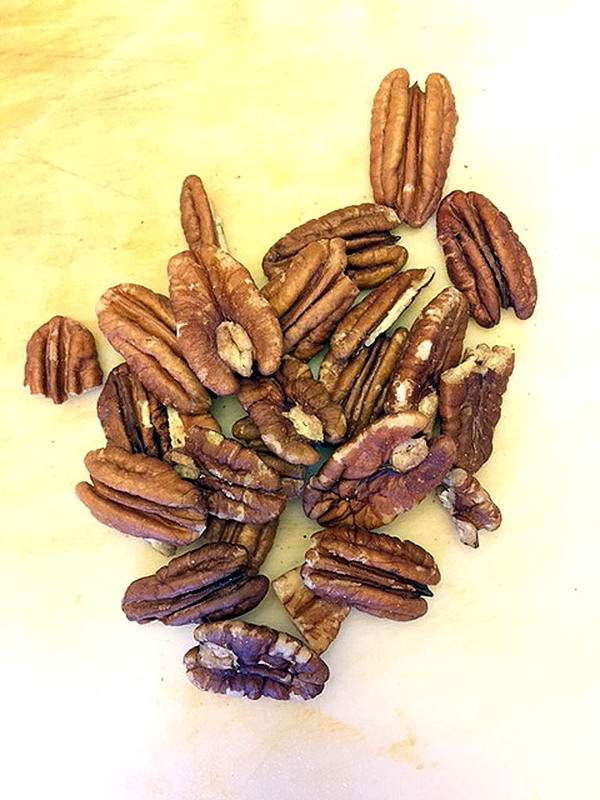 If you can’t eat pecans, no worries; just leave ’em out. I did mention a while back that you won’t see too many nuts in my recipes, but there are a few exceptions. In most cases you can omit them. A good substitute for the pecans is dried cranberries to keep that added sweetness. They were on the sandwich I ate, but I left them out of this one. And there you have it! This recipe makes enough for 2 or 3 more sandwiches, depending on how much stuffing you put in it. Because there was so much stuff in the sandwiches, I made them last longer throughout the week and only ate half of one along with some fruit for my lunches. And better yet, it was free, too! 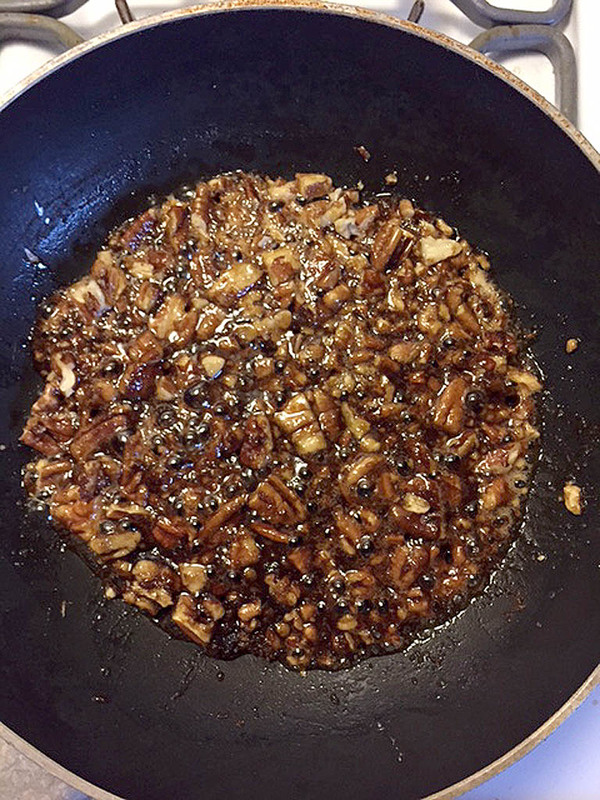 • For the chicken, drizzle some olive oil into a grill pan or large skillet. On medium-high heat, place chicken into the skillet, and drizzle the tops with a little olive oil, and sprinkle on garlic herb rub. Cook for a few minutes, then turn chicken over and sprinkle with seasoning. Cook both sides until browned and no longer pink, about 5-6 minutes each side. 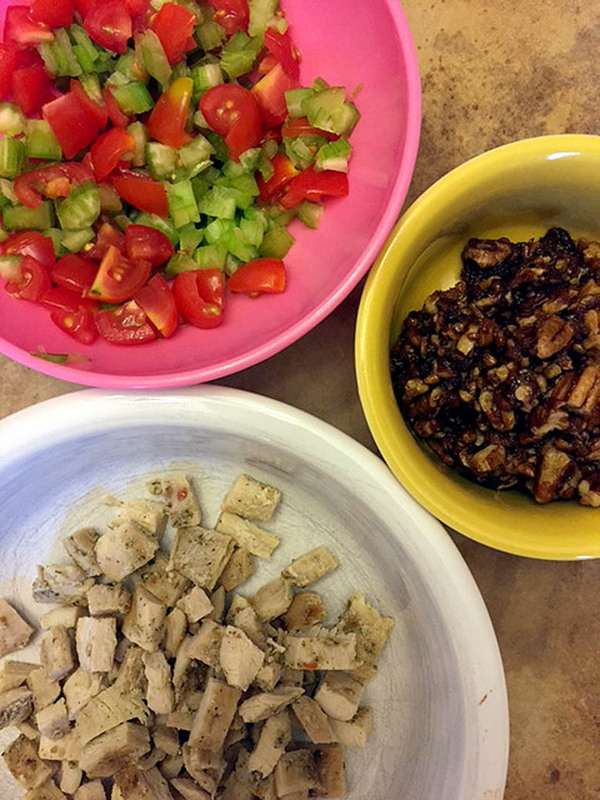 Transfer chicken onto a plate to let cool for a few minutes, then chop it up in small chunks. 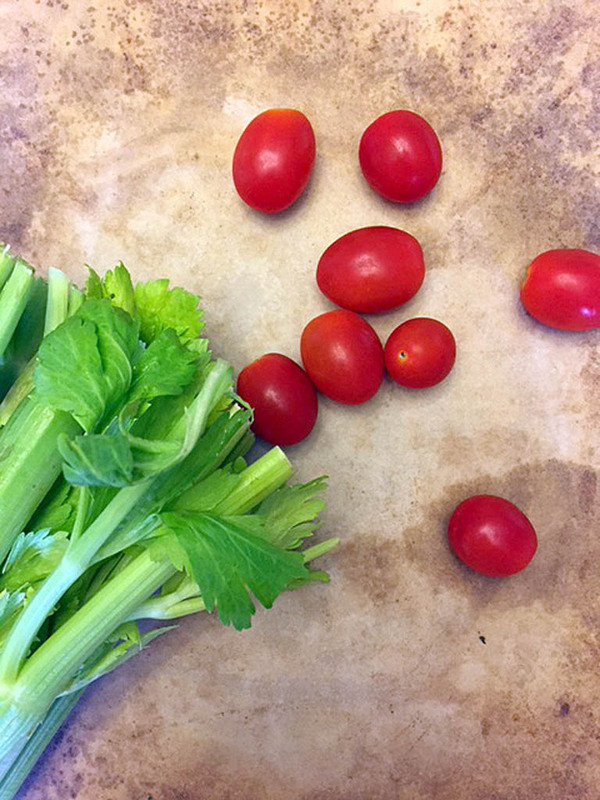 • Chop celery and tomatoes into small chunks and set aside. 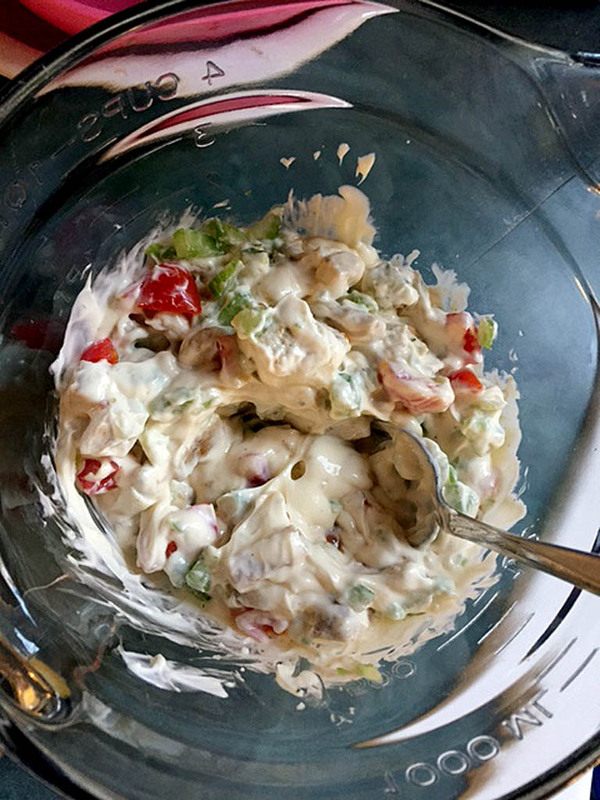 In a small bowl, add the mayo, celery, tomatoes, and chicken; mix together. • To assemble, place one slice of bread on a plate. Spoon on as much mayo mixture as you like. Next, place a few spring mix lettuce leaves and sprinkle on a few candied pecan pieces right on top. Place the other slice of bread on, and cut the sandwich down the middle. Enjoy! *If you don’t have any garlic and herb rub, you can mix together about 3 cloves of chopped up garlic, chopped fresh basil and rosemary. Rub it on the chicken, then place in the skillet. **I had candied pecans left, so I placed the bowl in the fridge. You can refrigerate them for a faster setting or just leave them on the countertop while you prep. 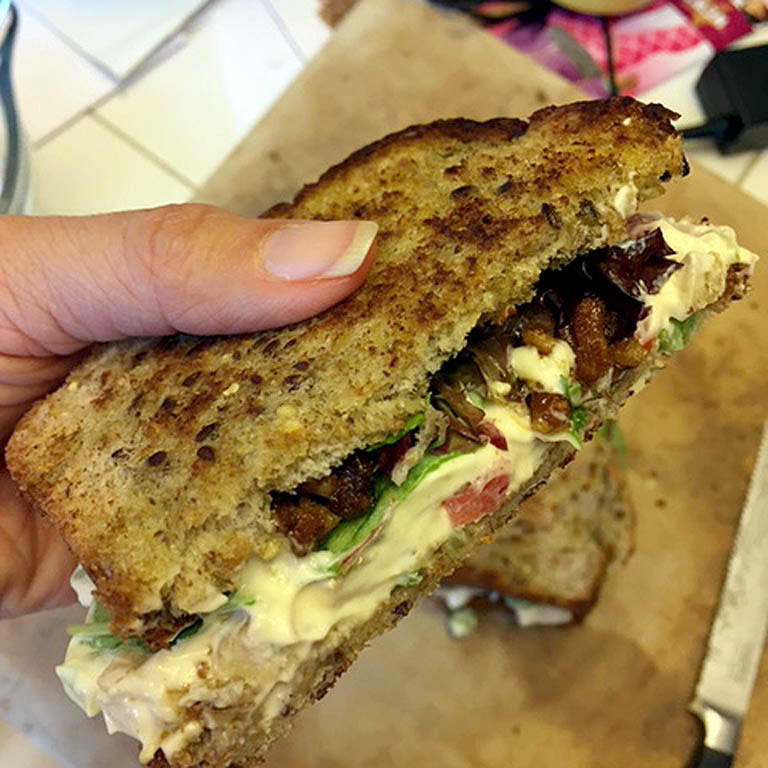 You can leave the pecans in the fridge throughout the week if you want to add more to your sandwiches.